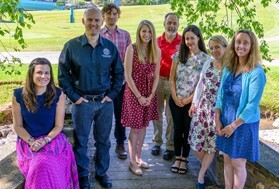 Harvest New York's goal is to expand and enhance Cornell Cooperative Extension's regional agriculture programs to spur agricultural economic development in New York State. The team began in 2012 in Western New York, expanded into Northern New York in 2016, and now extends into New York City to better serve all of New York. Focuses on dairy and food processing, with emphasis on dairy processing manufacturers making artisan cheeses, ice cream, yogurt, and other value-added dairy products. Increases investment and jobs in agricultural and food systems to enhance the viability of farms through expansion, value-added production, diversification, and distribution of locally produced fruits and vegetables. Promoting sustainable commercial agriculture development and entrepreneurship for urban farms producing in soil, greenhouses, or vertical/enclosed facilities through educational programming in production, harvesting, packaging, marketing, and food safety. Identifies the challenges faced by the craft beverage industry suppliers in New York State and works with researchers, production specialists, industry reps, and policy makers to overcome the barriers to growth. Enhancing development of the livestock and meats processing industries by assessing production and marketing challenges and guiding management practices. Provides producers assistance with farmstead development, facility layout, and environmental planning to optimize production on dairy, crop and livestock farms. Harvest New York is funded by New York State.